French physician; born in Amsterdam Nov. 4, 1771, died in Paris Jan. 12, 1841. He took the degree of M.D. at Erlangen in 1792, and practised at Vienna, Bamberg, and in Bohemia. In 1795 he went to Paris, where with Fourcroy, Cabanis, Desgenelles, and others, he founded the Société Médicale d'Emulation. For several years he had a hard struggle, but by 1811 his position had become secure; his books won him fame, and he became a member of the Board of Health (1816) and of the Academy of Medicine (soon after its foundation, in 1820). In 1829, with Esquirol, Parent-Duchâtelet, Orfila, and others, he founded the "Annales d'Hygiène Publique et de Médecine Légale," to which he wrote the introduction. After the Revolution of July, 1830, he became first physician to Louis Philippe. He embraced Christianity. 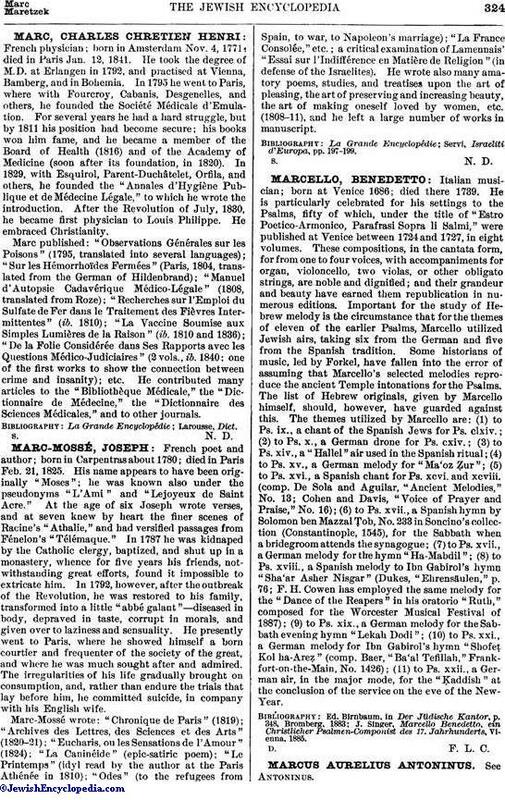 Marc published: "Observations Générales sur les Poisons" (1795, translated into several languages); "Sur les Hémorrhoïdes Fermées" (Paris, 1804, translated from the German of Hildenbrand); "Manuel d'Autopsie Cadavérique Médico-Légale" (1808, translated from Roze); "Recherches sur l'Emploi du Sulfate de Fer dans le Traitement des Fièvres Intermittentes" (ib. 1810); "La Vaccine Soumise aux Simples Lumières de la Raison" (ib. 1810 and 1836); "De la Folie Considérée dans Ses Rapports avec les Questions Médico-Judiciaires" (2 vols., ib. 1840; one of the first works to show the connection between crime and insanity); etc. He contributed many articles to the "Bibliothèque Médicale," the "Dictionnaire de Médecine," the "Dictionnaire des Sciences Médicales," and to other journals.